When Sean was back in the States, he was still broken. Then one day, a friend gave him a whistle and told him to “just keep it alive…” From then on, he wore that whistle around his neck and people have come up to him and asked about the meaning of that whistle. It was then that he chose to “make their (the boys) weapon his voice” and now Falling Whistles is a company based out of Venice, CA that sells whistles along with the boys story. 100% of the proceeds go to programs that will help rehabilitate children through local leaders in Congo and to advocate the war. 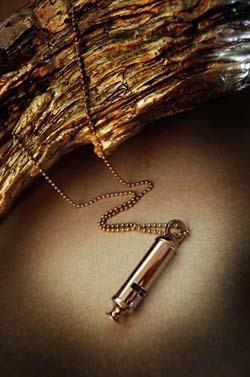 Falling Whistles will be selling the whistles at Space 1520 and Steven Alan. The company has also partnered with jewelry designer Lizzie Fortunato and she will be making a whistle every season. Sean hopes that he can distribute and share the information about the social issues in the Congo through fashion and the whistles. For more information and/or to purchase the whistles, please go to their website.